700 East Shawntel Smith Blvd. Extrication collars lay flat for easy storage assembles easily with just a few adjustments. 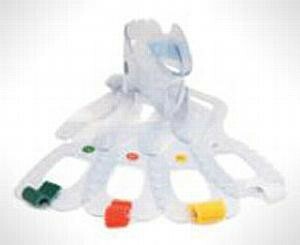 Since proper sizing is critical for good patient care, the collar features easily identifiable color-coded sizes. The large trachea hole offers excellent access to the neck for pulse check and advanced airway techniques. The low angle design of the chin piece ensures stable support, and it also prevents hyperextension. The patented transparency function of the Clear Collar allows medical personnel to visually monitor a patient's condition from the moment the collar is placed on the neck, until it is determined safe to remove. Available in Adult and Pediatric Sizes. Please specify your choice when ordering.